Homeowners must register boats with Aurora Shores before using Aurora Lake. You can register a boat by calling Madeline Osborne of The Coral Company at 216-932-4342. Own a power boat 20 feet or less in length or a sailboat 23 feet or less in length. Have a valid current year ALA decal for your boat that can be purchased through the Homeowner’s Association. Decals are $50 for power boats and $15 for non-motorized boats or boats with trolling motors. Carry a minimum of $1,000,000 liability insurance for power boats or $300,000 for non-motorized boats or boats with trolling motors. Follow all rules and regulations of Aurora Lake set forth by Aurora Lake Association. In 2008/2009 our lake was lowered for construction of a new dam. That gave us a rare opportunity to photograph the lake bed to show where obstacles to boaters are located. Click here to see these photos. Aurora Shores offers two beaches to its residents. The main beach of Aurora Shores is located at the Marina and also offers a sand volleyball court, tennis courts, a swimming pool and playground equipment. Boater’s beach is located on Surfside Circle and is accessible from the street or the water. The Marina Beach is guarded (see schedule) but both beaches are swim at your own risk. For schedules and more information refer to the Beach & Pools page. Boat docks are available for homeowners to rent at the Marina. Docks are rented on a first come first served basis and a limited number are available. The rental is for an entire season and the cost is $200. Please call Madeline Osborne of The Coral Company at 216-932-4342 for more information. Boat lifts cannot be installed on Marina boat docks without prior approval by the ASHA Board of Trustees and the ASHA Architectural Committee. Boat lifts mu st be removed at the end of every season. Water skiers from Aurora Shores and Hawthorn have formed a ski club, called the Aurora Lake Water Ski Club (ALWSC). The club was established to provide a community of skiers and non-skiers a way to learn how to ski, barefoot and wakeboard, as well as improve individual skill levels in each of these disciplines. For more information please visit The Aurora Lake Water Ski Club or contact Todd Piper at 513-290-6293. You are NOT REQUIRED to join the Aurora Lake Water Ski Club to water ski, wakeboard, barefoot or tube on any area of Aurora Lake other than the ski course area. You must be a member of both Aurora Lake Water Ski Club and USA Water Ski to ski in the slalom course. To join ALWSC or to renew your membership, please download and complete the Membership Application. Everyone who Ski's on the lake must ALWAYS USE A 3rd!! It is against the rules of both ALA and ALWSC to tow a skier without 3 people: a driver, a spotter and the skier. 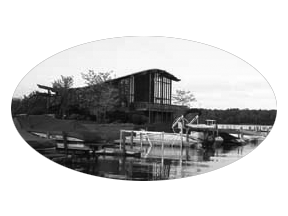 Aurora Lake Association is the governing body over Aurora Lake and sets and enforces all rules of the Lake. ALA is comprised of members of both Hawthorn and Aurora Shores for the purpose of managing Aurora Lake for all of our benefit. All meetings of the ALA are public and attendance is encouraged. ALA meets the third Monday of the month. Meetings alternate between the Hawthorn Clubhouse and the Aurora Shores Marina and are not held every month in the "off season". Please contact the ALA Board Members for information concerning dates and times for ALA Meetings.